You'd think with hubby away this week that I'd have been creating all kinds of art with lots to blog about, but not so. It has been both a satisfying and frustrating week. I vowed to get most of the prep done for my workshop and it is. Little kits all put together. White cotton fabric is cut, lists made, notes typed. Yes, this is good. I continue to add exercise daily, rowing, walking and finally now that the shoulder is healed, some swimming. 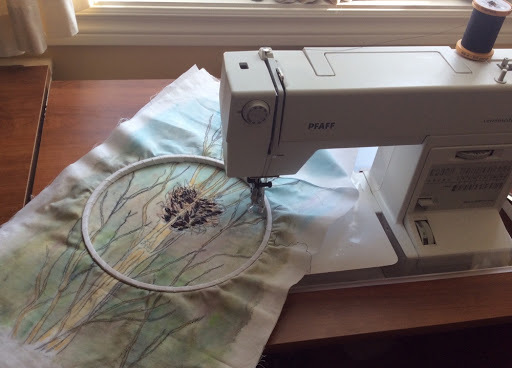 Last week, i was getting stressed over all of the mundane sewing that was piling up. I decided to put my fiber art aside and get some repairs done. I have put elastic into pjs, sewn a bathroom curtain, and made other clothing repairs. All good. 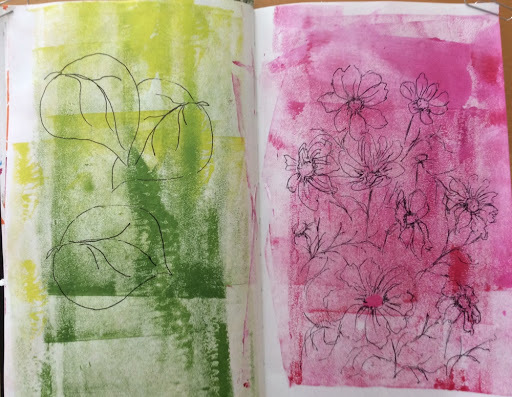 Just for fun, i wanted to try some monoprints and the gelatin mold that I'd seen on Linda Germain's blog using two colors and two steps with the gelatin mold. My first attempts didnt work at all. She was using ink and paper. I used fabric paint and white cotton. The results were a bit blurred and not inspiring. The clean up on my journal pages was better than the fabric prints. At least I'll have some nice pages to draw and journal onto. Then i went back to her post and rewatched the video. Aha, I'd left out a step. This afternoon, I decided to try again. Still the results were less than inspiring. The under layer of paint doesn't stay moist enough to transfer. There should be color in the white areas. A small bit of gold shows here. I'm using Setacolor fabric paints. When I search on line, I can't find an additive that would extend the drying time. This will require more research. I'll need to call a Canadian supplier to see what they recommend. Maybe, ill need to try a different brand of paint. Its not a complete loss. The prints are all useable. I can, add color, print on top, and free motion stitch to bring them alive to use in lots of small projects. I like it though--who doesn't--when the print is revealed as one pulls back the fabric from the gelatin mold and it makes me smile. Currently, I'm having a little respite from fiber art. Some of my mundane sewing repairs and odd jobs were adding up. I'm in between pieces so its a good time to catch up on these things. My artwork is never completely oiut of mind though. I picture new processes and how i might approach a new piece when i walk or swim--speaking of which--i may go back tomorrow for the first time in a while. My shoulder is healing well. Before physio this morning, made muffins. 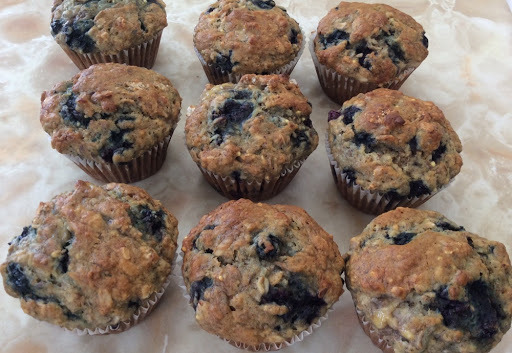 Banana, oatmeal, blueberry. I dropped a couple off along with books to a sick friend. 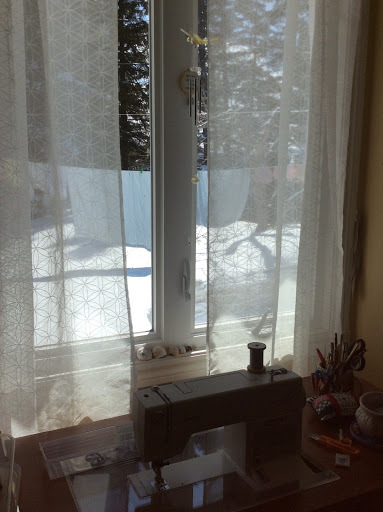 In my studio, I put up new shear curtains for the summer. 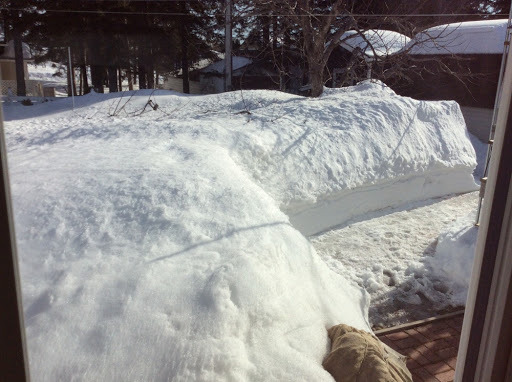 The snow has gone down a couple of feet, but as you can see, we still have lots. 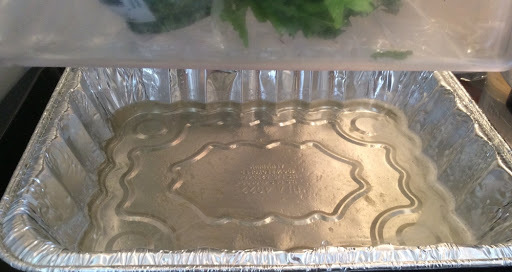 After lunch, I made a gelatin mold using a recipe I found for a 'permanent' one on Pinterest. 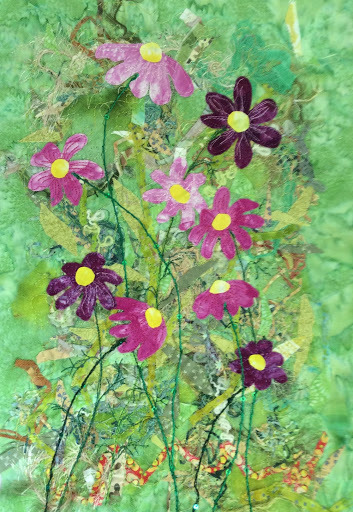 I wanted to try it since im teaching a printing workshop in May in Port Elgin, NB. Also, its a bit bigger than my purchased Gelli. 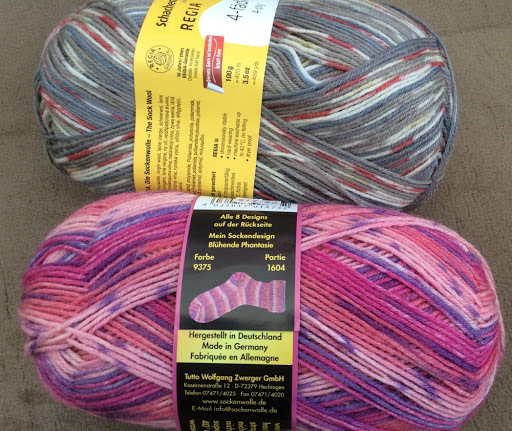 Our local yarn shop is closing soon and the nearest one is about 2 1/2hrs away. Ive been stocking up a bit. 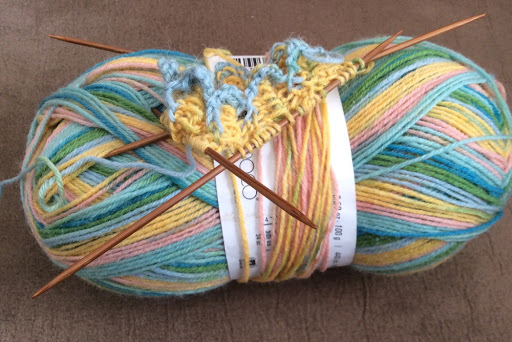 Several of us ordered a bag each in assorted color ways to make a sweater. Believe it or not they're all one color way. 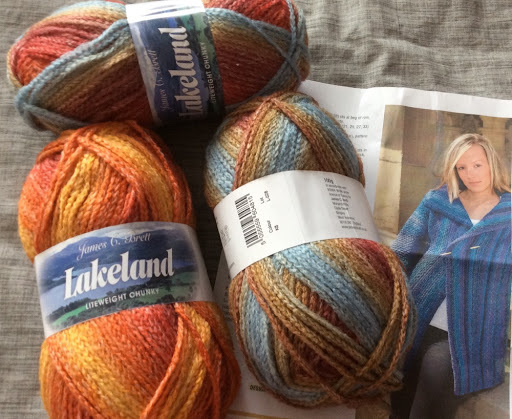 I gave up on making my own swearers a while ago but I've seen a couple of these done and i think it will suit me. 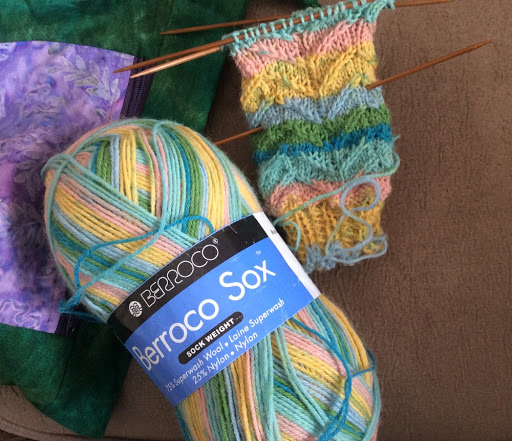 ( i hope) The owner alerted us by facebook this morning that she'd just received a sock yarn shipment, her last, so i had to run down after lunch. They will go fast. When i got home from guild sewing day last Saturday, I randomly put the pieces of a baby quilt up on the design wall. I can see that i will need a few more blocks with light centers. 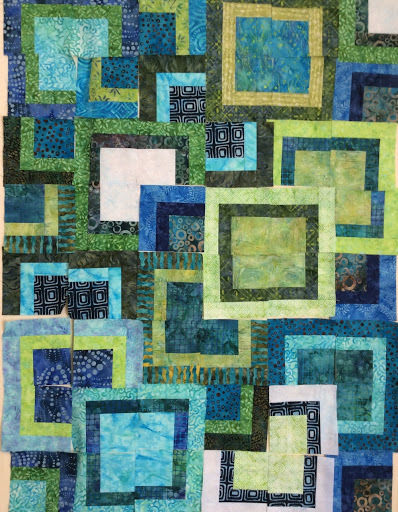 Before the next sewing day, I'd like to have all the blocks done so i can get them arranged and start putting it together. Ive been out for a walk and made my afternoon snack. After posting this I'll read a bit. We are back from our babysitting stint with Ollie. He's almost 4 months and still a good baby. We really had fun even though it wore us out. I could never have done it alone. 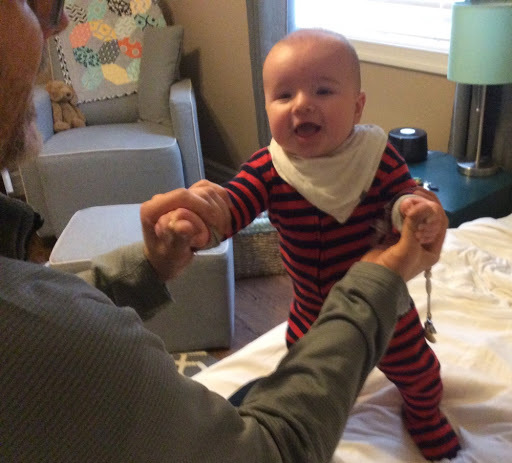 Grampie did most of the lifting, got up in the night nad changed most of his diapers. He didn't want to let him go. We even managed to take him out on errands and for a walk two days in a row. In the grocery store we laughed at ourselves because we'd forgotten to even brush our hair, lol. In the book store he spit up and luckily I had Kleenex in my pocket. We'd forgotten the diaper bag in the car. 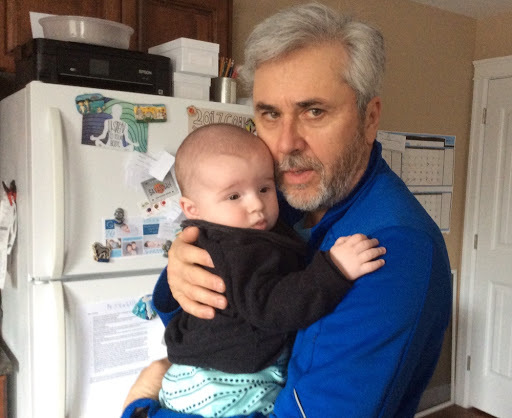 The life of a grandparent. 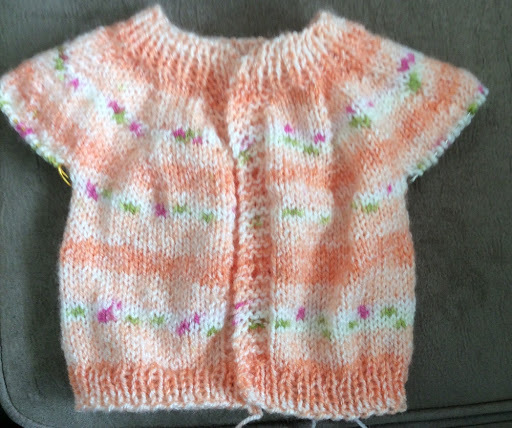 While I was there, in between baby time, cooking or cleaning, I knit on a new pair of socks and made a baby sweater minus the sleeves. Today, I stayed home, unpacking, washing clothes, and doing a bit of paper work in the morning, even squeezing in some rowing just before lunch. 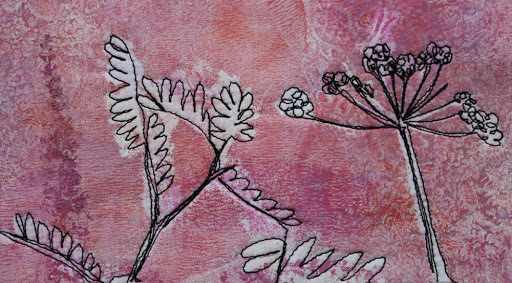 I updated my mono printing workshop info and posted on Facebook. 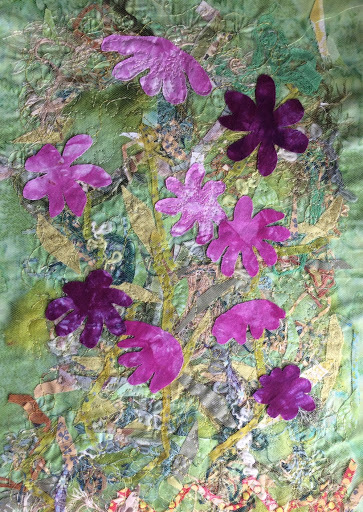 I'm excited to be giving it at the Spruce It Up quilt shop in Port Elgin on May 13th. I will be organizing and packing for the workshop for the next few weeks. 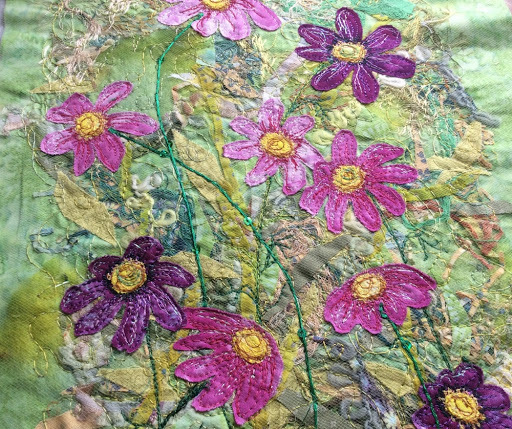 After lunch, I did what I think is the last of the stitching on the cosmos and backed it with batting. 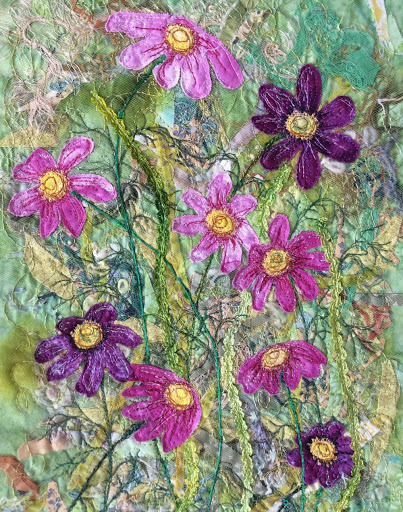 I've done so much stitching that I'm not sure exactly how I'll quilt it! It'll keep it minimal if I can-- I always have a hard time to stop. 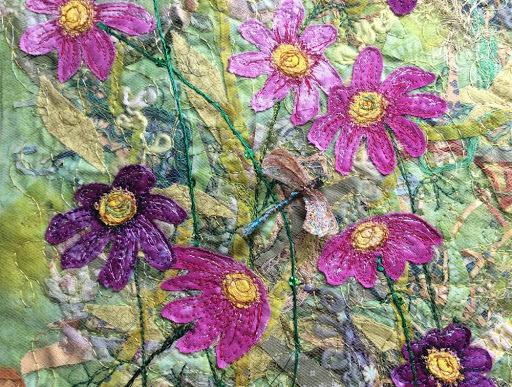 You may see the stitching in the detail. Now, it needs a few dragonflies. For supper, I took a bottle of turkey broth and meat from the freezer, to which I just added carrots, sweet potato, green onions, and brown rice. I even have corn bread muffins from the freezer. I need to do a couple errands this week but I really wanted a day of down time. I'm writing a quick post. 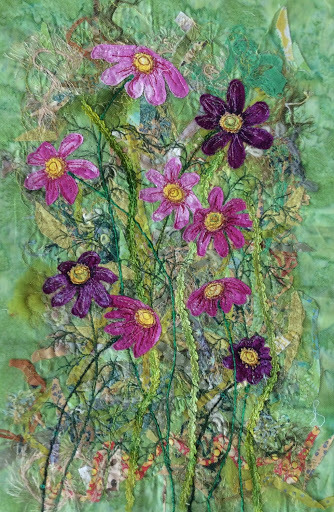 Instead of packing, I've been stitching on the cosmos, adding highlights, darks for definition and dimension here and there and a bit of sparkle. Putting it on screen really helps me to see where I want to add. I'm trying not so much for realism as fantasy. It's meant to be fun. I've been listening to CBC classical radio and stitching. When I should have been packing! Going to see our little one tomorrow. We're going to babysit for 2 nights. So excited! This is a little dragonfly from another piece. I will have to make a few more. 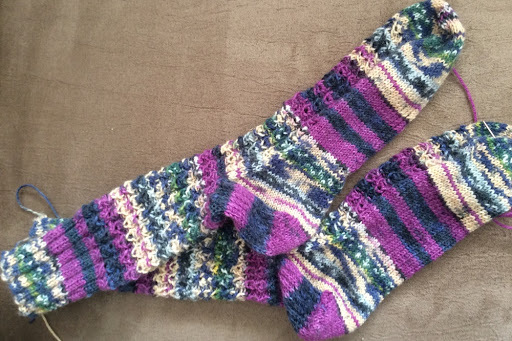 Here are my last socks finished, except for darning in the ends. And here are the ones I'm starting. They have a lacy edge and colors that say spring. Now I really must get packing! It is sunny with spring like temperatures again today and it hasn't yet rained on the snow. We may get it tomorrow. Conditions in the morning were perfect. My friend Alma and I have been getting out when we can and trying new trails. Friends took us today on a winding, hilly (some pretty steep ones) 3.5km trail to 'Don's Inn'. In the woods the air was crispy and cool with excellent snow conditions. We stopped for a rest and a snack at the hut before heading back. It sure doesn't look like spring, does it? After being confined for so long, I'm just happy to get out. 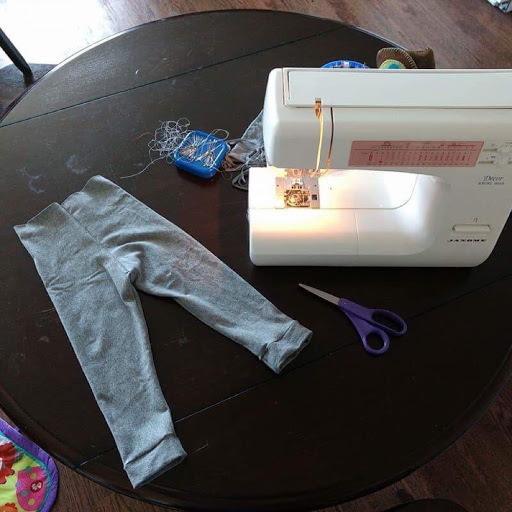 I don't have Ollie pictures but I do have a pic of a pair of leggings my daughter did this morning. She has sewn only a bit off and on but seems to be able to tackle anything. We're going to look for some fun prints. After our hike, I had to take Tylenol, and apply some heat while I had a light lunch. This was around 2:30. I haven't taken Tylenol in a while so it made me dopey but I headed to the sewing studio with my tea. I wasn't sure what I'd do. As you can see I can make a mess! Sorry, the window makes the picture dark. You get the idea. Love being able to get bedding and clothes on the line again. 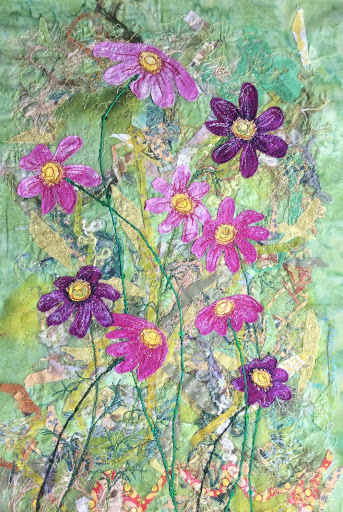 I spent a good hour sewing the stalks and adding a bit of light to a few flowers. I'm not nearly done; however, I stopped to cut the flower centres. Note, they'll look much better when I stitch onto them. It's meant to be a purely fun piece. I'll add more fronds, finish the cosmos, and maybe a few other flowers on bottom. It will need some dragonflies and bees. 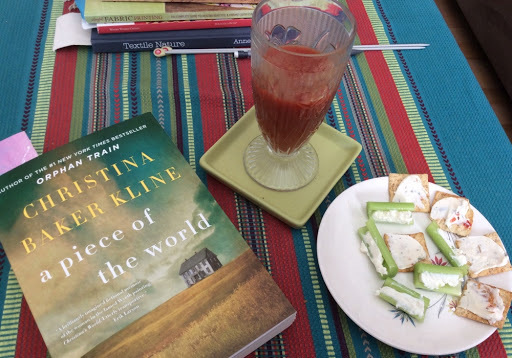 Well, I've done it now-- put my feet up to write this. I don't think I'll accomplish much more than supper, getting the clothes in, and some knitting later. We had another beautiful spring day here around 1C and sunny this afternoon. My friend and I are trying to make the best use of our snow. 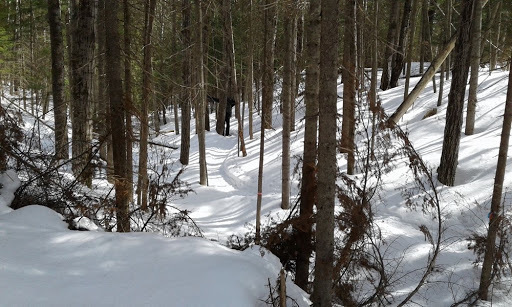 We're still trying new trails with the snowshoes. We went for 1 1/2hrs this morning. 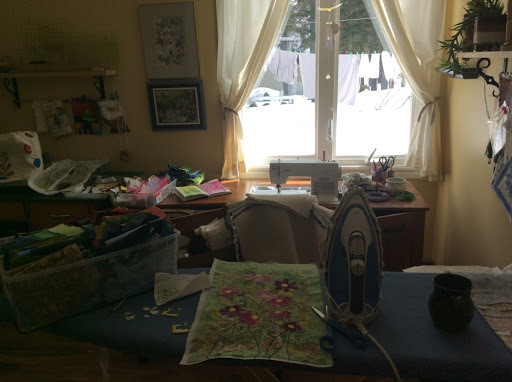 After visiting with the in laws, I was able to scoot into my sewing studio. Knowing that supper would be leftovers, I was able to stay until hubby got hungry, lol. This is the view as I'm sewing. In summer it is lush and green with flowers and veggies. Yesterday, I was thinking of my flowers and sketching on one of my painted journal pages--cosmos. It led me to pull out a small piece I started last fall. I had to see how it would look with fused cosmos and a bit of stitching. I want this to be a background for bees and dragonflies, something I got into making last summer. I know, as usual, I'm jumping around a lot but sometimes when an idea comes, I have to test it. Then I know how I'll proceed and I'll be satisfied that the 'thought' won't disappear into the mist. 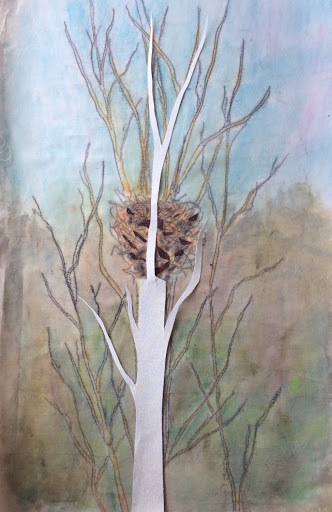 A couple weeks ago, I had been working on chickadees with a tree and a nest and something wasn't working for me. 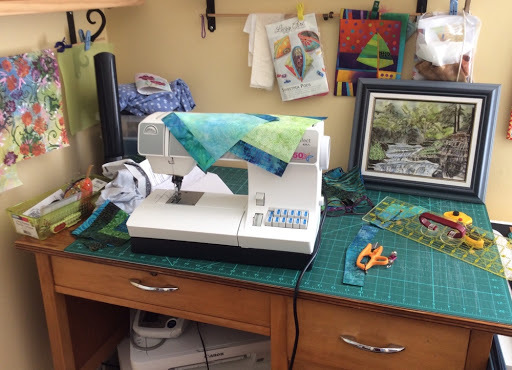 I put it aside but at my guild sewing day yesterday while flipping through pics on the I Pad, I saw a photo of the chickadees with the background and my first instant thought was that I liked it. I determined that I'd get it out today and progress with it. See where it goes. 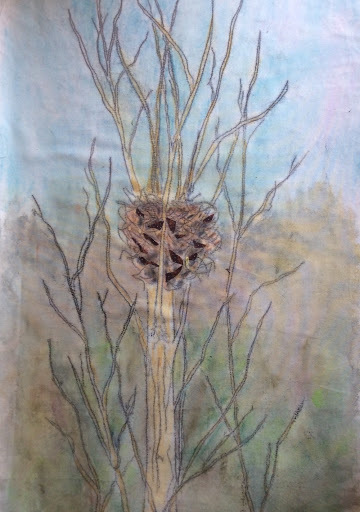 I added more paint to the background and the nest and a few snippets of dark fabric. I added a stiff interfacing, hooped it, and started stitching some of the black shadows. I will add other lighter colors to the nest simulating the bits of grass and moss. 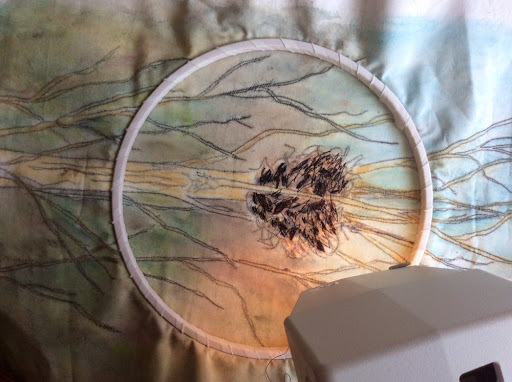 Once that's done, I will add fusible appliqué trees and branches. This gives you an idea of where I'm going. It will be white birches. Have you had a good weekend with some creative time?